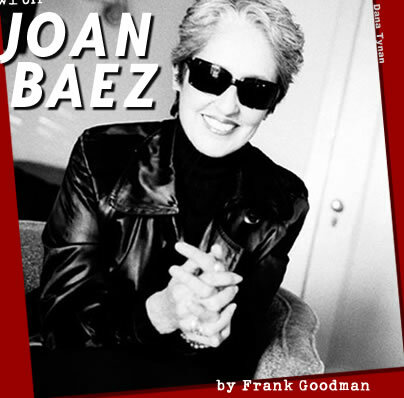 Whether you are 20 or 80, I probably don't have to tell you who Joan Baez is. Even though her heyday could be said to be decades ago, a high percentage of people would recognize her face, and many would recognize her voice, ringing like a bell that's mellowed and softened over a long time. A relentless activist for humanity, justice, and the environment over the course of a well-publicized lifetime, she has played the jewel in the crown for some and the thorn in the side for others. More than forty years, more than forty records. She's lived an awesome life, and has made contributions to global culture that reach far beyond the musical. So I was deeply charmed to find her so self- effacing and right-sized on the phone this day. She laughed easily, and effortlessly turned any compliment directed toward her in the direction of another without calling any attention to it. Although I don't generally feel this way during interviews, I so wanted to be in her company as we spoke. I only hope that the next opportunity we have to converse will be in person. We spoke a lot about her new release, Dark Chords on a Big Guitar, a title taken from a line in a Greg Brown song that's on the album. That was our jumping off point, anyhow. It's a great record, be sure to check out the clips on the Listen page, and use the links at the end of the interview to purchase it. We feel privileged to have had a chance to talk with one of the great women of song in our time, and are most happy to share that conversation with you here.